Big thanks to my buddy* Phil for this one. Deep copper body, clear and with a nice one finger head that sticks around for a minute then vanishes, leaving a pencil thin ring with sticky, webby lace. Uff! What a surprise! Grapefruit and rind out of the box. Hints of pine and compost mingle with the toasted malts. This is something different. Nice toasted malts, delicate caramel, sweet cooked apples and those wonderful PNW hops. Medium body, medium carbonation. Crisp and dry for the style, highly drinkable. If you are going to make a marzen regional this is the way to do it. The soft, smooth body from lagering is there with the unmistakable presence of Cascade/Centennial. A pleasant surprise! *Not at all my buddy. Dear Heater Allen, please put Bobtoberfest in 6, 12, 24, any number of multi packs next year and every year after that! Bob looks almost perfect. For an amber O'fest that is. Brilliantly clean and clear rust orange color with a hearty two fingered white foam resting proudly on top. It maintains a respectable surface coverage as well as rings of lace. Lifting the glass, I'm met with a breeze of sweet freshly baked biscuits slathered in orange marmalade. A drizzle of caramel and a side of golden raisins. This truly smells like a meal in a glass. Bob delivers the goods. Flakey warm biscuits come to mind, and all that raisin/caramel/marmalade influence is well subdued. The focus seems to be on the breadiness with a touch of toasted pumpernickel and just a touch of dry wild flowery hop finish. Bob has a full body. Like a middle aged man with a couple kids who still knows how to party, but balances some time for personal upkeep. Smooth and easy, comfortable, with some swagger and a little attitude to spice things up, but still a little softy for the important things in life. 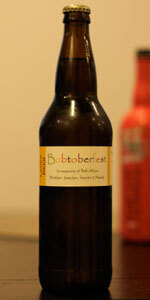 Bobtoberfest is a pretty damn good Oktoberfest. I'd be convinced this came from our Deutchland friends from across the pond, and to me, that's a hard thing to pull off. Will definitely be buying more. Prost! Clear amber orange with two fat fingers of long lasting white head. Plentiful lacing follows the liquid level as it drops. Smell is bread crust malts with a hint of grassy herbal hops. Taste is rich malts with a good but not too much bitter herbal hops. Mouthfeel is medium with ample carbonation. Overall a really fine O'fest type beer. I have never beer let down by this brewer. A bit hard to find but worth the pursuit. L: Looks amazing. Dark copper with some light brown hues. Biscuit head with good retention and a crazy amount of carbonation. S: Chocolate and malt. A little mineral graphite from all the carbonation. Mildly sweet but mostly mellow. T: Sweet malty flavor up front. Maybe some honey and a light molasses. Some crispy cookie notes with oats and even some ginger snaps. Again a graphite finish, likely from the carbonation, but this time a light hop bittering shines through. Bittering is an interesting mix of dried earthiness and leafy oils almost like a pile of downed leaves in fall from a variety of trees. F: Refreshing with a nice mild body behind it. Finishes slightly sweet and a light dryness builds. O: Quite nice. And especially nice considering the style often is underrepresented or associated with over excess by the liter. No, this is probably one of the best oktoberfests I've had in a long time. Pours a hazy honey orange with a foamy orange-tan head that settles to a small cap on top of the beer. A foamy lattice of lace coats the glass on the drink down. Smell is of malt, grain, biscuit, floral, and earth aromas. Taste is much the same with malt, floral, earth, and slight metallic flavors on the finish. There is a medium amount of earth bitterness on the palate with each sip. This beer has a lower level of carbonation with a slightly crisp mouthfeel. Overall, this is a pretty good beer with interesting floral qualities all around. Pours a slightly hazy, golden-amber-orange with a foamy, off white head. Herbal, grassy hops with sweet, malty notes being the focus. Medium body, fizzy carbonation. Crisp finish. A well done Marzen, though I would have liked a bit more of a robust malt character, but what do I know, it was still a tasty, enjoyable beer. Served on tap into a pint glass. A- Poured a very clear and dark copper color with tons of streaming carbonation, white soapy head that left webbed lacing. Really nice rich color and clarity on this Marzen. S- Big aroma of rich caramel malt, cereal malt, grainy notes, toffee, and nutty notes. Very aromatic and malt forward. T- Big rich caramel malt notes, cereal malts, grainy notes, nutty notes, toffee, some light grapelike fruity notes on the finish, and a hint of sweetness reminiscent of vanilla or a cream soda on the finish. M- Very creamy, smooth, medium to fuller bodied, prickly carbonation, and dry finish. Very easy to drink and no alcohol presence. O- This is a world class Oktoberfest beer right up there with my longtime favorite of the style from Great Lakes Brewing Company. Very nice malt profile, creamy mouthfeel, and nice sweetness on the finish.